Use this Mortgage APR Calculator with Amortization Schedule to determine the Mortgage APR (Annual Percentage Rate) for your mortgage. 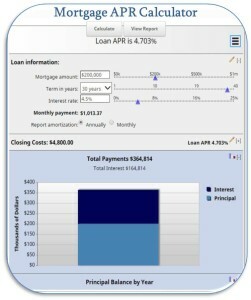 The Mortgage APR calculator will also generate the monthly payment for a mortgage. Press the report button for a full amortization schedule, select either a yearly amortization table or a monthly amortization table. Feel free to use Today's Mortgage Rates in this mortgage APR calculator. You may also email the results by clicking on the three-line icon in the upper right hand corner of the mortgage calculator.